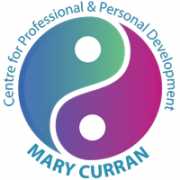 Mary Curran is one of Ireland’s most experienced professional and personal development coaches, as well as a trainer and supervisor. Mary’s background is in Public Relations and Marketing. She set up her own business, Pavlova Pantry, an Australian-style restaurant, which won the ESB Innovative Business Ideas Competition in 1988. In November 1999, she opened the Centre for Professional & Personal Development. She works with SMEs, industry bodies, professional consulting and financial services firms. Her clients include the Law Society of Ireland, AIB Bank, Ulster Bank, Institute of Engineers, Laois Chamber of Commerce, Team of Solicitors, Bridgestone Ireland, Oracle and Accenture, where her coaching was instrumental in preparing senior managers to become partners. Mary is also on the faculty for VHI Corporate Solutions, where she provides facilitation, training and coaching on work-life balance, retirement planning, stress management and change management. Mary is accredited in a number of behavioural psychology models and psychometrics which are integrated into her coaching work. The Centre for Professional & Personal Development will be exhibiting at Jobs Expo Dublin on 7-8 May 2016 at Croke Park.